“From where I can download Offline Virtual Calculator for GATE 2019 Exam ? 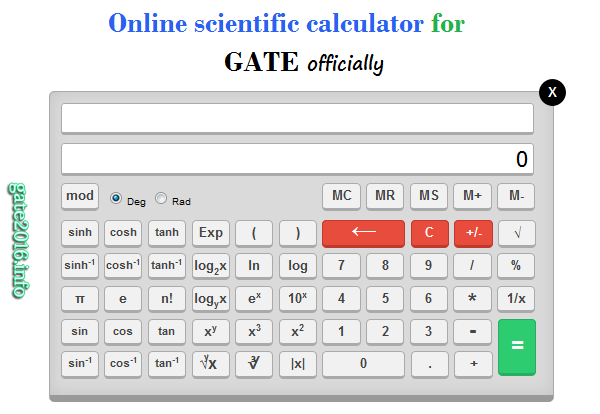 Download Free Offline Virtual Calculator for GATE 2019 – There are many GATE 2019 aspirants who neither can access internet on daily basis nor have android mobile phone. So we created an offline virtual calculator for such GATE 2019 aspirants. This offline virtual calculator will help them in their GATE 2019 exam preparation. This calculator design is same as the design of calculator defined by IIT, Madras. IIT, Madras is GATE 2019 organizing institute. How to Download & Use this Offline Virtual Calculator for GATE Exam ? It will download a WinRar file named “Gate Offline Virtual Calculator” in your system. You need to have WinRar software installed in your computer system to open this file. (1) It is an offline virtual calculator designed for GATE aspirants. (2) Click on “Gate Offline Virtual Calculator”. It will open a calculator. (3) Files in folder “rs” also required to run this offline virtual calculator. We would like to remind you that IIT, Madras conducted GATE 2019 exam. IIT, Madras has introduced some critical changes in GATE 2019. Which you can check using the link given below. 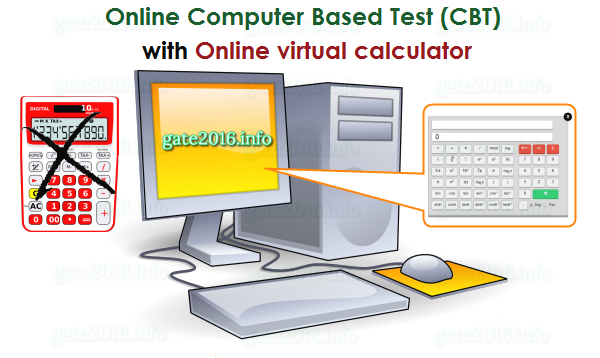 From GATE 2016 exam Virtual Calculator will be used by candidates in GATE exam instead of any kind of physical calculator. Candidates will not be allowed to carry physical calculator with them to the exam hall for GATE 2019 examination. So candidates must practice on this GATE 2019 Virtual Calculator. Thank you sir aapne meri sari problem solve kar diya AGAIN ………THANK YOU. first of all thank you for your regular guidance. I am preparing for gate2017 i have passed my btech this yr(not doing coaching this yr). last year i have done summer gate crash course in ace hyd. what i know is in gate exam, fundamentals are very important. while i am solving problems after studying coaching notes, i m feeling that I am lacking in fundamentals. some say do more and more problems, some say follow reference books. what should i do to make my fundamentals clear do more problems or study reference books even after studying coaching notes with having time constraint to complete the syllabus? No calculator is not allowed in DMRC exams. It is JE exam so just prepare basics and be strong in basics. Also command on second paper which is English. 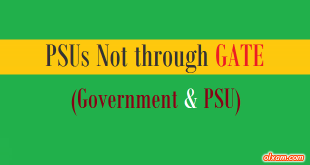 As per GATE 2016 office information GATE 2016 paper will not contain any such question which can not be solved by this GATE 2016 official virtual calculator. So if you think there is any function which can not be solved by this GATE 2016 official virtual calculator you can skip. i have download virtual calculator on my PC but it does not open on my PC…what application is required to open that file?????….. Yes. Examiner will provide you 1 or 2 blank paper. You can demand for more blank paper(s) if you require. THANKS.. you r doing a very good job by posting some gate info,psu info,virtual calculator and all.. thank u so much. god bless u.
is it possible to download virtual calculator in androi mobile ? We are currently working on it. Actually GATE exam would be a computer based test. So we created a computer based offline virtual calculator first.